Giant sequoia trees (Sequoiadendron giganteum) are the largest living things on Earth. They can live for thousands of years, reach almost three hundred feet in height, resist droughts and forest fires. The single largest sequoia tree now living, General Sherman, has sequestered over a lifetime of carbon emissions by the average American. What is more, giant sequoias can grow throughout much of the world in temperate regions, including most of the continental United States, so long as they have sufficient water (around 30 inches or 762 mm each year). Sequoias grow in Britain, but also in mainland Europe, New Zealand, Australia, Japan, Canada, and almost every state in the U.S.
Establishing sequoias is very difficult, and with trial and error you can expect years of frustration, even if you buy saplings rather than seeds. 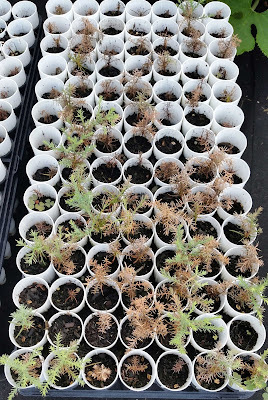 Even with saplings we didn't have any success establishing sequoias outside in the Midwest until we started using the Waterboxx PlantCocoon to grow sequoias for the first few years. Since starting to use the Waterboxx PlantCocoon, we have had 100% success, detailed here and here. 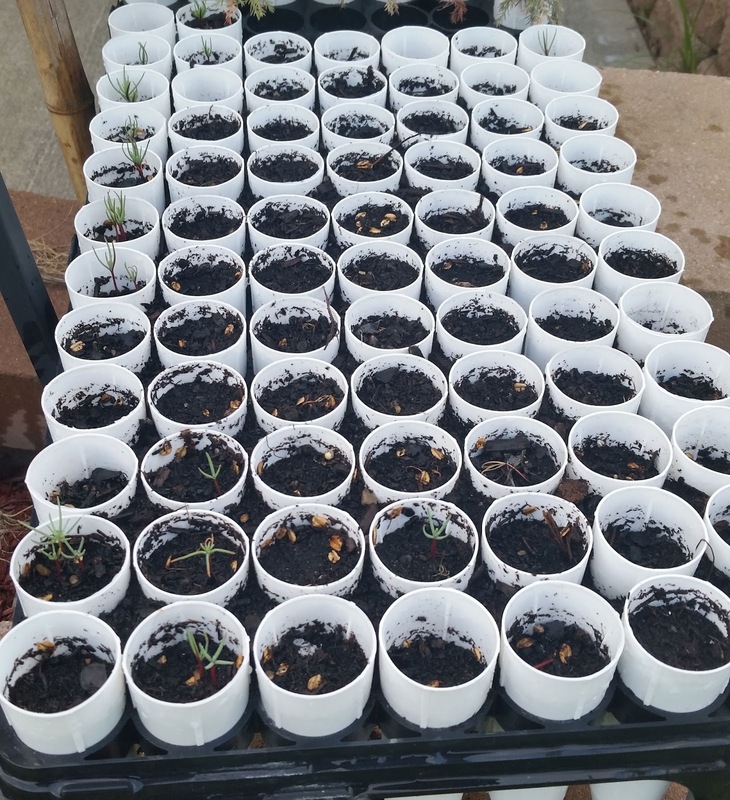 As sequoias proved such fun to plant and are so beneficial to the environment, we wanted to know if we could grow sequoia trees from seed. We had tried this before, but had very poor germination rates (around ~1%), and many of our trees that did germinate soon died. We were determined to try again, but to follow the best advice available for growing these seeds. So, to start off, we acquired 2000 more sequoia seeds from Myseeds.co, our preferred site. We expect again about a 10% germination rate, so perhaps around 200 trees. 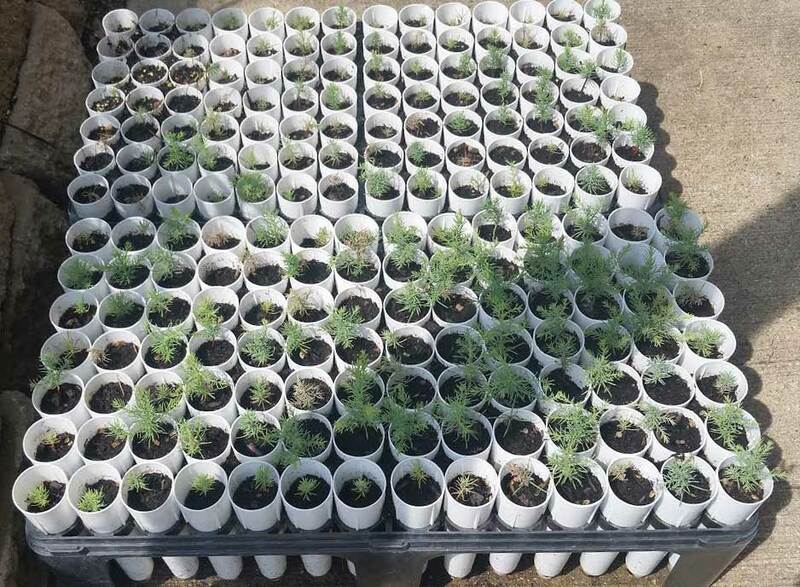 We plan to distribute these trees across the country for growth with the Waterboxx in a few years. 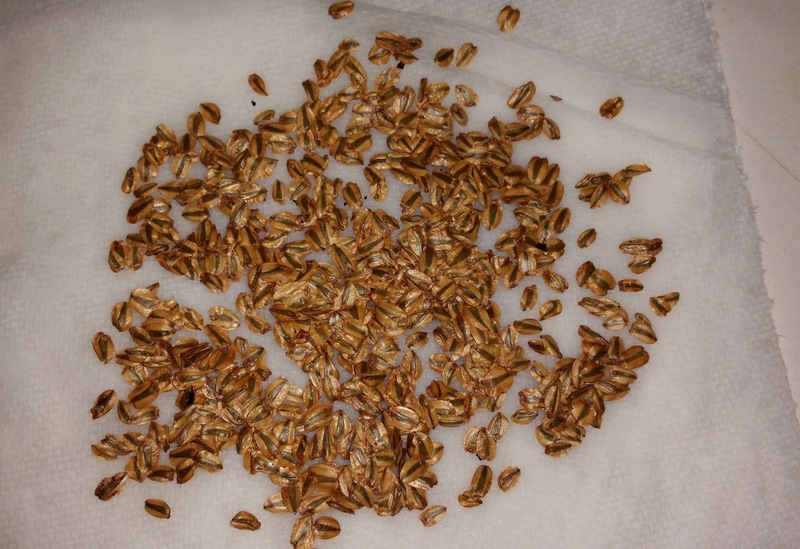 Seeds on July 16, 2015, right after getting them in the mail. Our biggest problem was having the patience to not plant before "hardening" for a month in the fridge. We covered these seeds with another moist paper towel, and them put them on a portion of a paper plate. We then put these in a clean, sealed plastic bag. This simulated our wet "fall", in order to reawaken the seeds. For our winter, we placed this plastic bag in the vegetable crisper in the fridge for 30 days. First, wet one of the paper towels with the distilled water. Lie this paper towel flat on the paper plate. 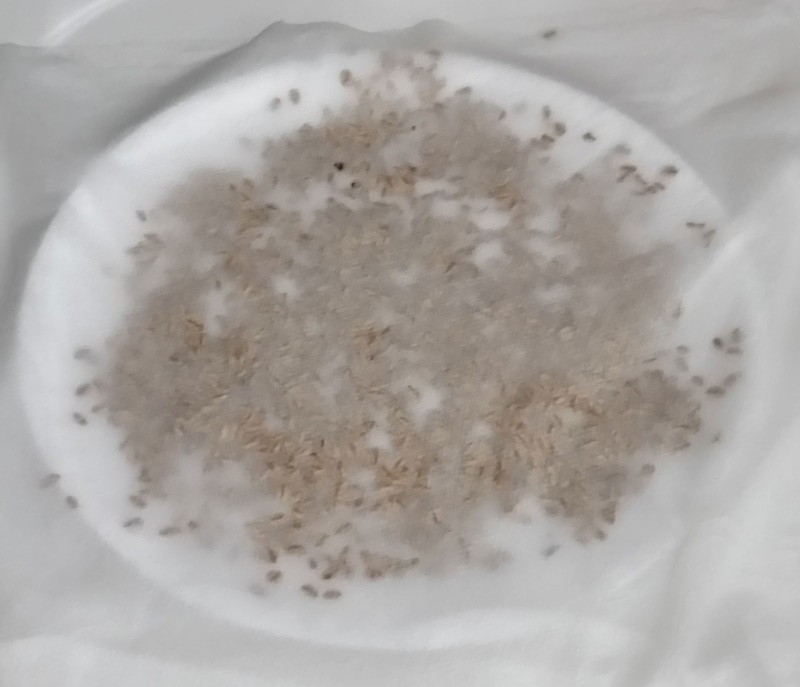 Then, carefully spread the (small) sequoia seeds on the wet paper towel, as evenly as possible. Next, take the second paper towel and wet it with the distilled water. Lay this carefully over the paper plate now covered with sequoia seeds. If some seeds get pushed off the plate, we would pick them up and put on the plate - remember that each seed may grow into a tree that will store a lifetime of carbon emissions and live for millennia. Next, we need to make the large paper towel fit in the plastic bag. We folded the corners of the paper towels in to fit it on the paper plate. 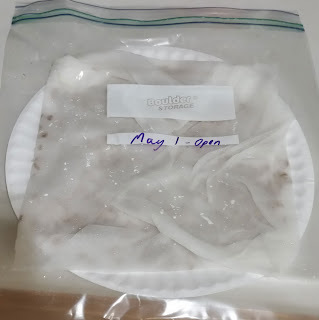 We then slid the paper plate into the bag, labeled it with the date we plan to open it (one month later). We plan to plant the seeds into their germination site - cone-tainers - in about one month. 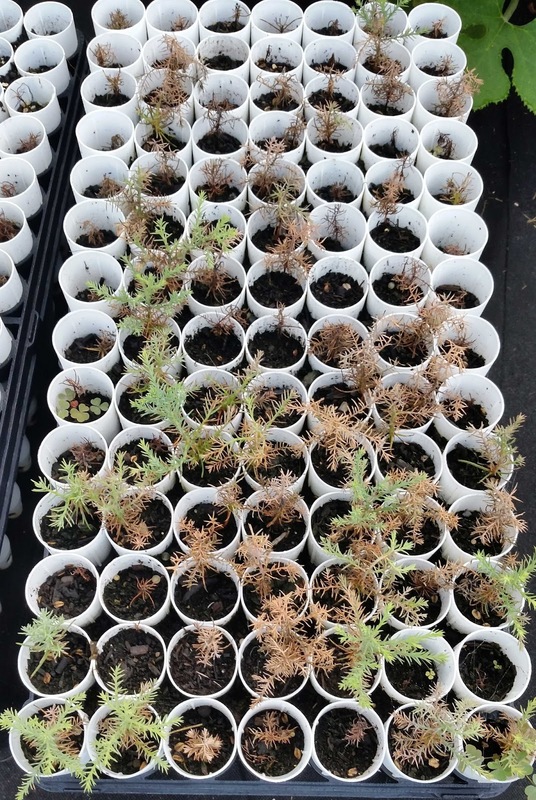 After about one to two years - when the trees reach about 12-16 inches in height, the sequoias will be ready to plant. We will plant the sequoias with the Groasis Waterboxx during our annual spring sequoia donation and planting, or distribute the trees to our customers. 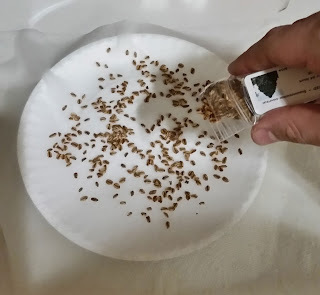 We have had truly terrible weather here, so we are a few days behind in planting the seeds, but we did pull our sequoia seeds from their fridge scarification to be planted in the cone-tainers. 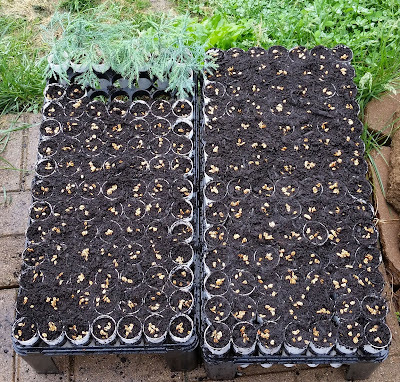 We tried to plant about 11 seeds per cone-tainer, going on the assumption that we actually did have 2000 seeds to start. The sequoia seeds after a month's cold stratification on May 3, 2016 -about 2000 in all. We first filled the Cone-tainers with potting soil, then scattered the seeds on top of the soil. If the seeds are still moist, you will find them somewhat difficult to get off your fingertips. To help, we would suggest using tweezers. We then gently pressed placed the seeds on the top of the soil, before pressing them slightly into the soil and covering them with the smallest layer of potting soil we could. 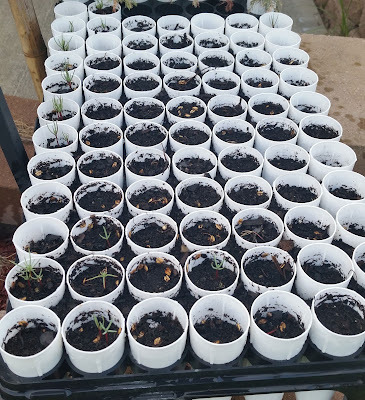 We then moved both trays of cone-tainers into our outdoor coldframe in an attempt to prevent excessive cooling of the soil at night (which would retard germination). Within about 3 weeks, we did begin to see germination. We had used two different lengths of Cone-tainers. The smaller SC7 had a depth of 5.5 inches, and the larger SC10 had a depth of 8.25 inches. We began seeing a large difference in the germination rates between these two Cone-Tainers, even with almost everything being equal. The longer SC-10 cone-tainers had a much higher sequoia seed germination rate than the SC7 Cone-Tainers. We believe this was almost entirely due to the increased water holding capacity of the longer Cone-Tainers. For this reason, we plan to plant in the future using only these SC10 Cone-Tainers. Many of the SC10 Cone-Tainers even had multiple seeds germinate - a truly impressive feat! The other issue that may have been causing a difference in germination was the amount of shade. The better germinating SC10 Cone-Tainers had at least a few more hours of shade each day. For this reason (as our test plot was mostly open to the direct sun) we moved both underneath a shade cloth - better mimicking their natural environment. We did notice that some Cone-tainers (each of which have about 11 seeds) had multiple seeds germinate while some Cone-tainers had no seeds germinate. 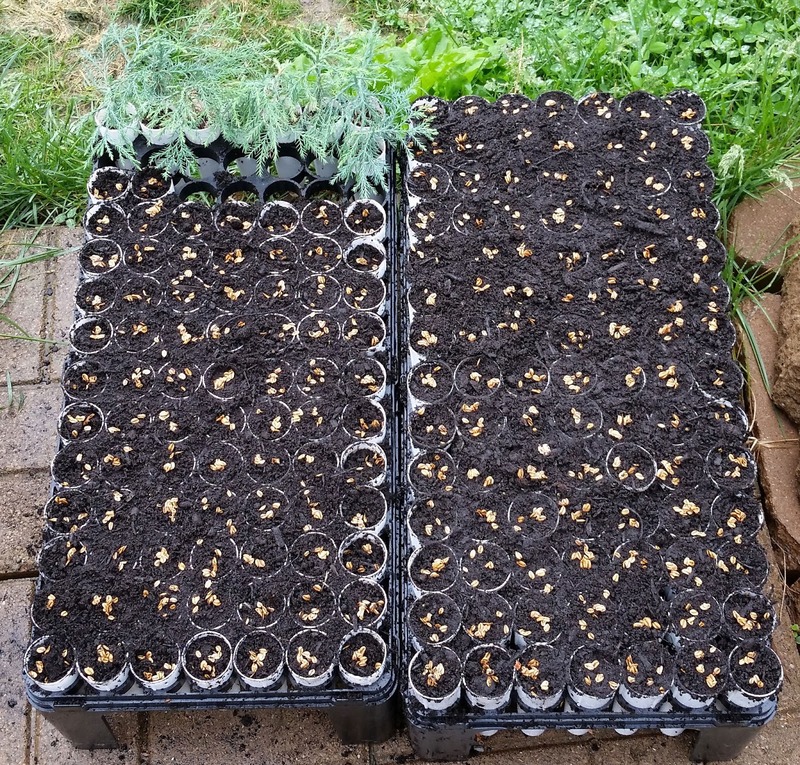 We wanted to move the extra seedlings to empty Cone-tainers, so we waited until a decent rain when the soil was moist and malleable. We then gently grasped the extra sequoias by their crown, usually one at a time, and pulled straight up. We were as careful as possible not to disturb the tap root. We then used a tweezers to create a deep, narrow hole in an empty Cone-tainer and inserted the sequoia there. 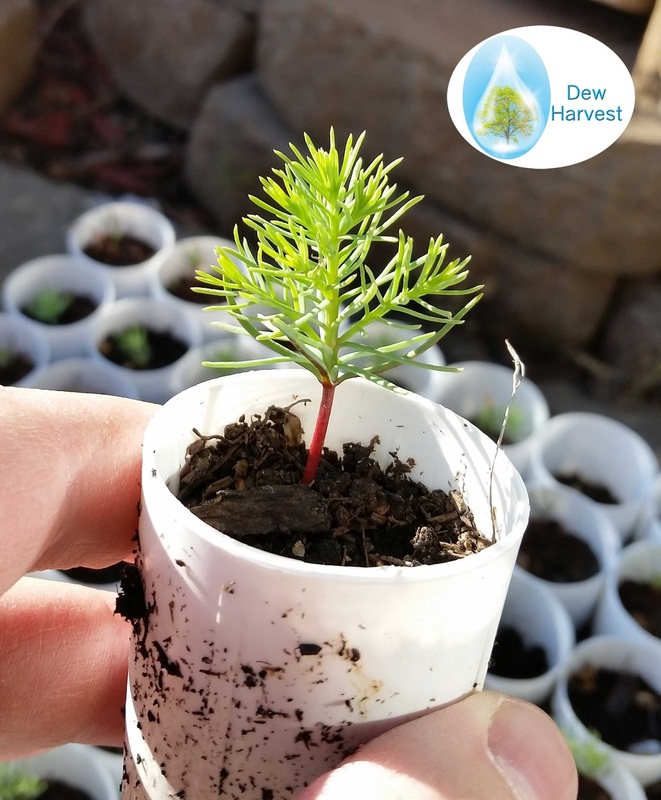 We water our sequoia seeds and seedling every day. This is the most important step - dry sequoias equals dead sequoias at this point in their life. 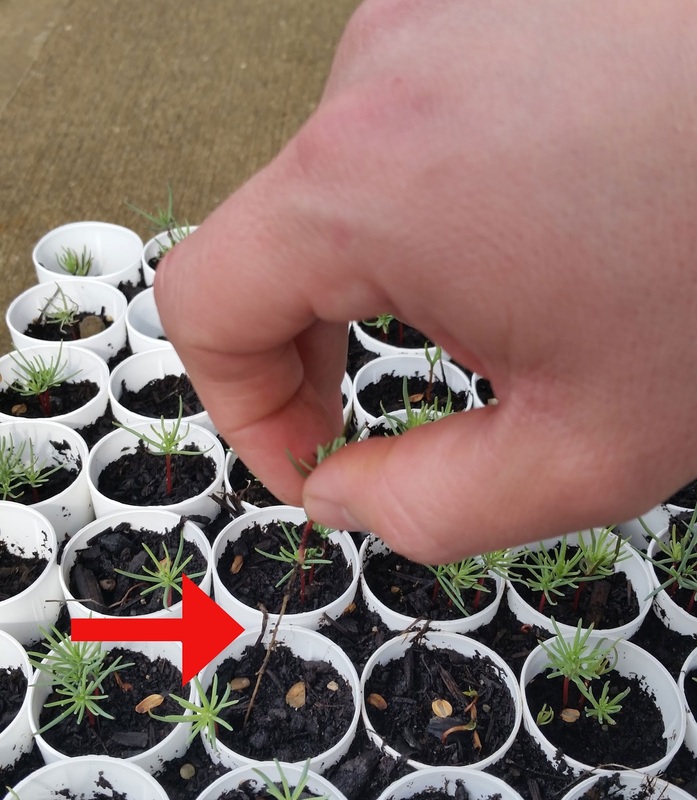 By early July, some sequoias are still sprouting but others are finally starting to develop quit an impressive crown. A sequoia grown from seed, at approximately 2 months old. This tree might live for 2500 years after being established with the Waterboxx. 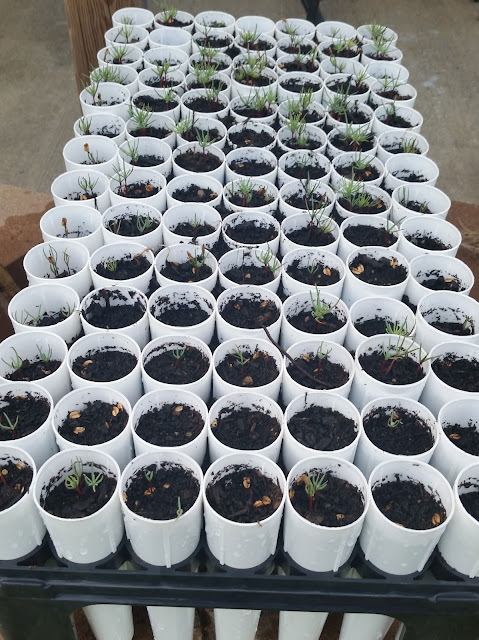 We hope to see these sequoias grow to the point they can be transplanted outdoors with the Waterboxx PlantCocoon®. They will need to be about 10-15 inches tall at that time. We are growing these sequoias for donation to a few growing partners in the South and Midwest and perhaps to a few lucky customers as thank yous - we will post those plantings online when pictures are available. Like much of the eastern U.S, August was very wet for us, with up to four inches of rain in 2-3 days time. Our sequoias were outside in all of this, and even with good drainage, their roots quickly became waterlogged with the near constant rain. We subsequently lost about 85% of our crop, another very dissappointing outcome. Terrible loss of tree life after days of heavy rain - a bitter disappointment. As we cannot control the rain and cannot bring the trees inside during heavy rains, we plan to try again next year with all the tricks we have learned. We will be growing the sequoias inside cold frames with 30-70% shade cloth, all with the larger cone-tainers. This will be our third attempt to grow this giant tree from seed on a large scale. It should be noted that the tree survives superbly once planted with the Waterboxx - as seen here and here. Our greater hope is to see giant sequoias planted on public and private property throughout the United States and rest of the world. This tree grows so large, so fast, and lives so long, that it may be one of the few affordable ways to decrease carbon dioxide in the atmosphere, counteracting the problems caused by excessive carbon dioxide. If you would like to plant sequoias you already have outside, with the Waterboxx, you can buy a Waterboxx PlantCocoon here. I will make sure to track your progress. Did your sequoia from 2014 survive? Yes - both the sequoias planted outdoors with the Waterboxx survived and one is now doing well without the Waterboxx. We plan to plant sequoias in Zone 5 (northern Indiana) as well as Zone 7 (Oklahoma) next spring. A friend in Germany enjoys growing giant sequoias like this. He also travels often to see those in the Sierra Nevada, as well as the coastal redwoods. Coast redwood now exceeds all known giant sequoia for girth. Have you started a 2017 batch of giant sequoias? "Giant sequoia trees (Sequoiadendron giganteum) are the largest living things on Earth". I think that should be 'tallest' rather than 'largest' - Agathis australis and Eucalyptus regnans are larger trees, because they are less tapering. Their forests contain more wood / store more carbon for a given land area.